This is the second Topic LP of the music of Tommy McMahon and Bernard Oâ€™Sullivan. 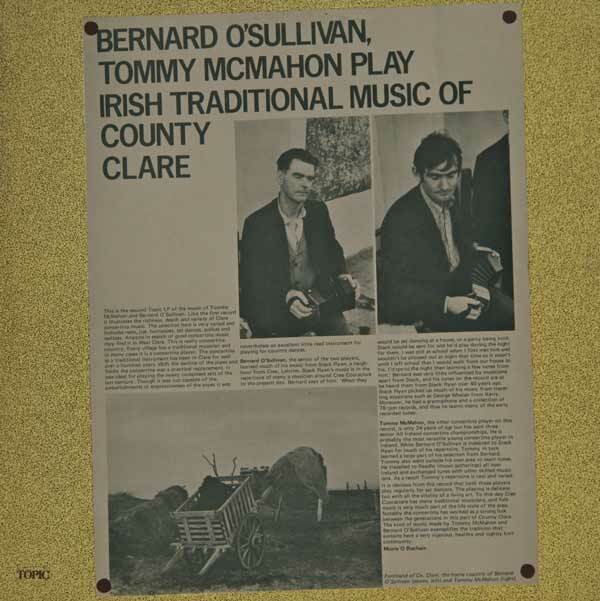 Like the first record it illustrates the richness, depth and variety of Clare concertina music. The selection here is very varied and includes reels, jigs, hornpipes, set dances, polkas and waltzes. Anyone in search of good concertina music may find it in West Clare. This is really concertina country. Every village has a traditional musician and in many cases it is a concertina player. The concertina as a traditional instrument has been in Clare for well over a hundred years. With the decline of the pipes and fiddle the concertina was a practical replacement. It was ideal for playing the newly composed sets of the last century. Though it was not capable of the embellishments or expressiveness of the pipes it was nevertheless an excellent little reed instrument for playing for country dances. First issued by Topic Records 1976.